Saskatoon, SK, October 31, 2016 – Competing against seven of the city’s culinary best, Radisson Hotel Saskatoon’s Executive Chef Scott Torgerson claimed first place at Gold Medal Plates Culinary Competition in Saskatoon. Torgerson’s win came less than 24 hours after returning home victorious from the Culinary Olympics in Germany, the largest and most prestigious culinary competition in the world. The gold medal win secures Chef Torgerson a coveted spot at the Canadian Culinary Championships, The Gold Medal Plates Finale, in Kelowna, BC, February 3-4, 2017. The win is one of many recent accolades for Chef Torgerson. As a member of the 2016 Culinary Team Canada Olympic team, Chef Torgerson helped win three gold and two silver medals in Erfurt, Germany, before arriving home to defend his 2015 second place finish at last year’s Gold Medal Plates Saskatoon. Chef Torgerson’s winning plate featured a black trumpet crusted roast elk and Cactus Lake beef tenderloin with porcini and sunchoke foam, plated with broccoli puree, parsnip, beef tendon puff, pearl onion, and micro cress. Helping to balance the flavours, the dish was paired with the 2014 Inniskillin Discovery Series Zinfandel from Inniskillin, Okanagan, BC. Judged by a panel of eight, each dish was awarded points based on visual presentation, texture, technical achievement, taste, wine compatibility, and wow factor. Visitors can experience Chef Torgerson’s award-winning culinary skills at Aroma Resto Bar at the Radisson Hotel Saskatoon. 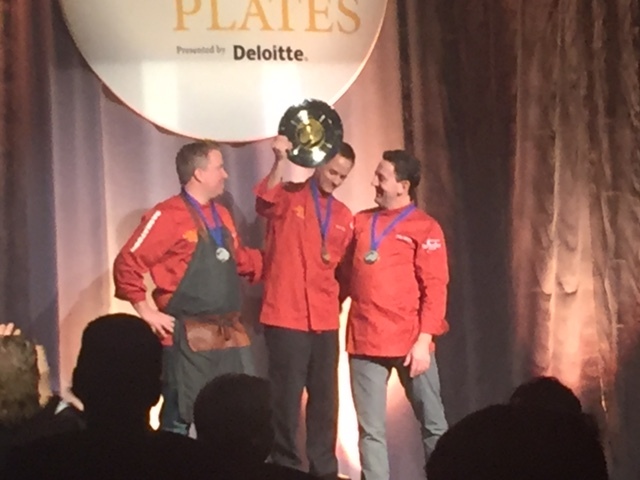 Founded in 2003, Gold Medal Plates Culinary Competition is an annual celebration of Canadian Excellence in cuisine, wine, the arts and athletic achievement. Every year, premier chefs across Canada compete for the gold, silver and bronze medal. Net proceeds from Gold Medal Plates are given to the Canadian Olympic Foundation which supports Olympic and Paralympic athletes and high performance programs. To date, the competition has raised over $11 million to support Canadian athletes. SilverBirch Hotels & Resorts is one of Canada’s leading hotel operations and asset management companies and manages a large portfolio of full-service, focused service and extended stay hotels across Canada. The company manages hotels operating under major franchise brands, such as Marriott, Hilton and Radisson. www.silverbirchhotels.com.